CELEBRATED “ART” PLANETARIUM SHOW COMES TO TUCSON! The psychedelic imagery of Android Jones has earned the artist a devoted world-wide following. Now you can travel through Jones’ fantastical animated dreamscapes in this immersive fulldome planetarium show, powered by Flandrau’s state-of-the-art fulldome digital projection system. With a hypnotic soundtrack from British electronic music producer and sound designer Tipper (electronica, trip-hop), Samskara will take you on a mesmerizing journey to another dimension. The name of the show, Samskara, is the Hindu word for a ritual that marks a major life event. Jones, inspired by travels in India, draws on imagery from Hindu scriptures for his digital fantasy art, interwoven with images of animals and patterns and textures from nature. Jones has dubbed this realm of visual expression “electromineralism.” In the show, the densely detailed illustrations flutter, ripple, and pulse with life to create a vivid alternate reality. 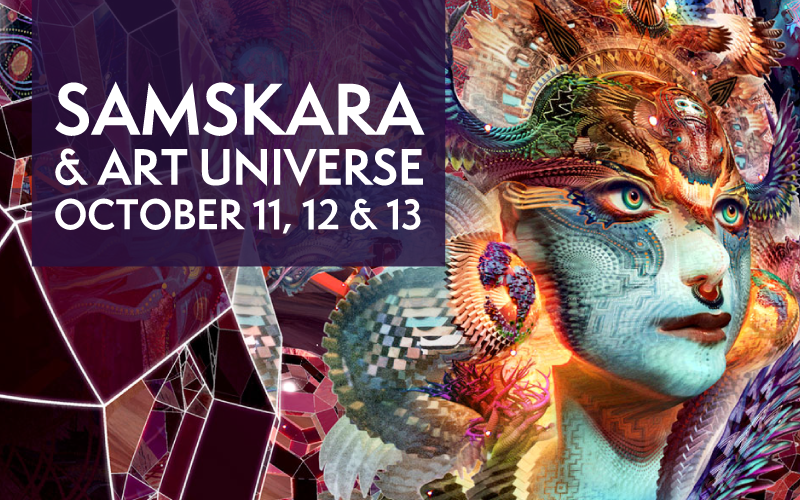 Samskara will be shown in combination with another animated ‘art’ planetarium show called Art Universe that highlights the work of Jones and several other contemporary visual artists including Craola, Chris Saunders, and Risk. Produced by the art collective Likuid Art, the Art Universe show highlights different artistic styles and with music tracks by Dynamite Laser Beam as it visits one visually distinctive ‘planet’ after another. In combination, these two fulldome art planetarium shows,Samskara and Art Universe form the vanguard of a whole new realm of artistic expression. The fulldome projection system in the planetarium dome at Flandrau provides an immersive visual and sonic environment where the audience is transported into the world of the artist’s vision, and the boundary between the audience and the artwork melts away. Join us for this limited engagement. You’ve never experienced anything like it. PLEASE NOTE: Fulldome visuals can create dramatic sensations of motion, which may make some viewers feel uncomfortable. This show is intended for adult audiences. Samskara & Art Universe show tickets are $12. Tickets will be available for purchase online (convenience fee applies) and at the Flandrau front desk during regular business hours. No discounts or promotions applicable for Samskara tickets. Seating is limited, arrival prior to showtime advised. No refunds are available.